The incessant honking is driving me crazy. I can hear it from my hotel room, which is on the 6th floor and is on the side of the building that doesn't even face the street. Car horns, motorcycle horns, truck horns, hand-squeezed rickshaw horns... even little bells connected to bicycles. The latter two are laughably ineffective amid the cacophony of mechanical horns. My the driver I had today is exceptionally prodigious honker. Most people honk very quickly just to let traffic know they are there. Not my driver. He lays on the horn almost constantly. It is rude and irritating. On the drive back to my hotel from the office where I'm working there was a traffic jam. The past couple of days there were also traffic jams that were the result of a car broken down. The European man behind the wheel of one of the broken down cars had a bewildered look on his face. I have no idea what a person is supposed to do if his car breaks down, but I have even less of an idea why this man was driving in this city in the first place. Anyway, I expected just another broken down car today, but as we got closer I realized it was 2 large cows walking down the street, oblivious to all the traffic they were holding up. 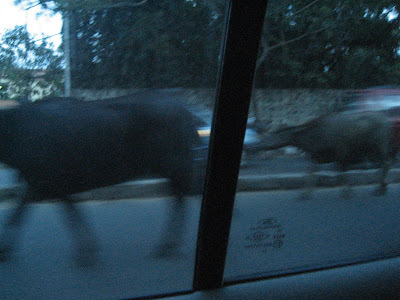 Chennai is a large (larger than LA) and crowded city and here are these cows stuck in traffic. I don't know where they came from or where they were going. Cows are sacred in India so people let them go where they please, but the traffic wasn't honoring the animals. The way traffic was going around the them, the cows were sort of trapped in the middle of the road. The vehicles honk at the cows, literally tail-gate them, and (like anything else on the road) gets within an inch of hitting the cows. I hope, for the cows' sake, that the cows really are enlightened because any other animal would be terrified.